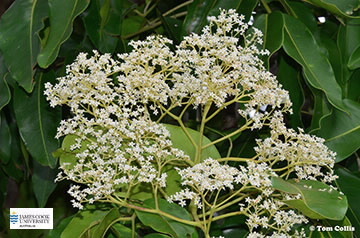 This native tree, which has been planted in several places on the Cairns campus, has opposite, compound leaves, with leaflets roughly 10 x 5 cm, leaflets 6-12 per leaf, with the terminal leaflet usually missing. 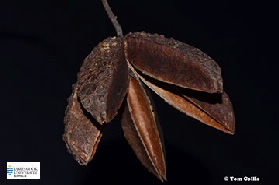 Leaflets are hairless. Flowers are arranged in panicles, about 6 mm diameter; 5 white petals and 5 stamens. Fruit is a woody capsule very rough on outside, opening by 5 valves, valves adhering by their bases and spreading like a flower, seeds winged.